Dogs, cows, sheep, horses, pigs, and birds -- over the past 15,000 years, our ancestors domesticated dozens of wild animals to keep them as farm animals or pets. To make wild wolves evolve into tame dogs, the least aggressive animals, or most gentle ones, were selected for breeding. Tameness was therefore the key criterion for selection. Over time, it wasn&apos;t only the animals&apos; behavior that changed, but their appearance as well -- with the same changes emerging across various species. For example, domestic rabbits, dogs, and pigs all have white patches, floppy ears, smaller brains, and shorter snouts. In science, this suite of traits is referred to as the domestication syndrome. A team of researchers led by Anna Lindholm from the Department of Evolutionary Biology and Environmental Studies at UZH has now also observed this phenomenon in wild mice (Mus musculus domesticus) that live in a barn near Zurich. 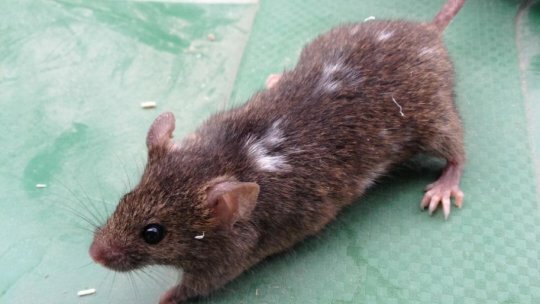 Within a decade, this population of mice developed two of the distinct phenotypic changes: white patches in their otherwise brown-colored fur as well as shorter snouts. "The mice gradually lost their fear and developed signs of domestication. This happened without any human selection, solely as a result of being exposed to us regularly," says Anna Lindholm. The evolutionary biologist has been studying the mice that live in the empty barn for about 15 years. These animals are regularly provided with food and water, and investigated by the researchers. Scientists&apos; knowledge about the domestication syndrome comes from a remarkable experiment that began in Siberia in 1959. Soviet geneticist Dmitry Belyaev tamed wild foxes and investigated their evolutionary changes. He selected the tamest animals from among every new generation. Over time, the foxes began to change their behavior: They not only tolerated people, but were outright friendly. At the same time, their appearance also changed: Their fur featured white patches, their snouts got shorter, their ears drooped, and their tails turned curly. It appears that a small group of stem cells in the early embryo -- the neural crest -- is responsible for these behavioral and physical changes that take place in parallel. The ear&apos;s cartilage, the teeth&apos;s dentine, the melanocytes responsible for the skin&apos;s pigmentation, as well as the adrenal glands which produce stress hormones are all derived from these stem cells. The selection of less timid or aggressive animals results in smaller adrenal glands that are less active, and therefore leads to tamer animals. Changes in the color of fur and head size can thus be considered unintended side effects of domestication, as these traits can also be traced back to stem cells in the neural crest that were more passive in the early stages of development. The observations of the study&apos;s first author Madeleine Geiger increases the understanding of how house mice began to live in closer proximity to humans, attracted by their food, some 15,000 years ago. As a result of this proximity alone, the rodents got used to people and became tamer. "This self-domestication resulted in the gradual changing of their appearance -- incidentally and inadvertently," says Geiger. Evolutionary biologists assume that the development from wild wolf to domestic dog also initially began without the active involvement of humans. Wolves that lived near humans became less timid and aggressive -- the first step in becoming domesticated.